A couple of days ago I had coffee with Peter Norvig. Peter is currently Director of Research at Google. For several years until recently, he was the Director of Search Quality -- the key man at Google responsible for the quality of their search results. Peter also is an ACM Fellow and co-author of the best-selling AI textbook Artificial Intelligence: A Modern Approach. As such, Peter's insights into search are truly extraordinary. I have known Peter since 1996, when he joined a startup called Junglee, which I had started together with some friends from Stanford. Peter was Chief Scientist at Junglee until 1998, when Junglee was acquired by Amazon.com. I've always been a great admirer of Peter and have kept in touch with him through his short stint at NASA and then at Google. He's now taking a short leave of absence from Google to update his AI textbook. We had a fascinating discussion, and I'll be writing a couple of posts on topics we covered. An offline phase that extracts "signals" from a massive web crawl and usage data. An example of such a signal is page rank. These computations need to be done offline because they analyze massive amounts of data and are time-consuming. Because these signals are extracted offline, and not in response to user queries, these signals are necessarily query-independent. You can think of them tags on the documents in the index. There are about 200 such signals. An online phase, in response to a user query. A subset of documents is identified based on the presence of the user's keywords. Then, these documents are ranked by a very fast algorithm that combines the 200 signals in-memory using a proprietary formula. The online, query-dependent phase appears to be made-to-order for machine learning algorithms. Tons of training data (both from usage and from the armies of "raters" employed by Google), and a manageable number of signals (200) -- these fit the supervised learning paradigm well, bringing into play an array of ML algorithms from simple regression methods to Support Vector Machines. And indeed, Google has tried methods such as these. Peter tells me that their best machine-learned model is now as good as, and sometimes better than, the hand-tuned formula on the results quality metrics that Google uses. The big surprise is that Google still uses the manually-crafted formula for its search results. They haven't cut over to the machine learned model yet. Peter suggests two reasons for this. The first is hubris: the human experts who created the algorithm believe they can do better than a machine-learned model. The second reason is more interesting. Google's search team worries that machine-learned models may be susceptible to catastrophic errors on searches that look very different from the training data. They believe the manually crafted model is less susceptible to such catastrophic errors on unforeseen query types. This raises a fundamental philosophical question. If Google is unwilling to trust machine-learned models for ranking search results, can we ever trust such models for more critical things, such as flying an airplane, driving a car, or algorithmic stock market trading? All machine learning models assume that the situations they encounter in use will be similar to their training data. This, however, exposes them to the well-known problem of induction in logic. The classic example is the Black Swan, popularized by Nassim Taleb's eponymous book. Before the 17th century, the only swans encountered in the Western world were white. Thus, it was reasonable to conclude that "all swans are white." Of course, when Australia was discovered, so were the black swans living there. Thus, a black swan is a shorthand for something unexpected that is outside the model. Mediocristan, consisting of phenomena that fit the bell curve model, such as games of chance, height and weight in humans, and so on. Here future observations can be predicted by extrapolating from variations in statistics based on past observation (for example, sample means and standard deviations). Extremistan, consisting of phenomena that don't fit the bell curve model, such as the search queries, the stock market, the length of wars, and so on. Sometimes such phenomena can sometimes be modeled using power laws or fractal distributions, and sometimes not. In many cases, the very notion of a standard deviation is meaningless. Taleb makes a convincing case that most real-world phenomena we care about actually inhabit Extremistan rather than Mediocristan. In these cases, you can make quite a fool of yourself by assuming that the future looks like the past. The current generation of machine learning algorithms can work well in Mediocristan but not in Extremistan. The very metrics these algorithms use, such as precision, recall, and root-mean square error (RMSE), make sense only in Mediocristan. It's easy to fit the observed data and fail catastrophically on unseen data. My hunch is that humans have evolved to use decision-making methods that are less likely blow up on unforeseen events (although not always, as the mortgage crisis shows). I'll leave it as an exercise to the interested graduate student to figure out whether new machine learning algorithms can be devised that work well in Extremistan, or prove that it cannot be done. The internet and its usage are generating vast amounts of data. The volume of new data being generated today is unprecedented in human history. Much intelligence might be gleaned by intelligently mining this trove; yet most companies today archive most of their data and process only a tiny sliver of it. For example, most internet companies I know with significant traffic archive all usage data older than a couple of months. Who knows what gems of insight they're missing? Over the past few years, the hardware platform that can tackle very high data volumes has been identified. It is the cluster of commodity Linux nodes interconnected using commodity gigabit ethernet. Google popularized the platform and introduced Map Reduce, which today is the best tool available for serious data crunching on massive scale. The Hadoop project makes Map Reduce available to the rest of us. Database systems have been the workhorses of conventional (small to medium scale) data analysis applications for a couple of decades now. They have some advantages over Map Reduce. SQL is a standard for ad-hoc data analysis without actually writing code. There's a big ecosystem around SQL: people familiar with SQL, tools that work with SQL, application frameworks, and so on. Joins are straightforward in SQL, and databases provide implementations such as hash joins that scale well to big data. There is a large body of knowledge around query optimization that allows declaratively specified SQL queries to be optimized for execution in nontrivial ways. There is support for concurrency, updates, and transactions. There is a metadata catalog that allows people and programs to understand the contents of the database. No one has been able to make database systems scale to the data volumes we are seeing today at an affordable price point. Sure, there is Teradata, with their custom designed hardware/software solution. They are the only serious game in town for sophisticated analysis of data in the terabytes. But the entry price point is in the several millions of dollars, and if your data size increases, the price per incremental terabyte is also at nosebleed levels. Also, proprietary hardware ignores the inexorable logic of Moore's law. What the world needs is a database system natively designed and architected from the ground up for the new hardware platform: commodity clusters. Such a system greatly expands the number of companies and people that can do data analysis on terabytes of data. I'm delighted that Aster Data this week launched exactly such a database system this week. I led the seed round investment in Aster Data and sit on their board, so I've been waiting for this launch with great anticipation. Aster comes with impressive testimonials from early customers. MySpace has been using Aster for several months now to analyze their usage data. Their data set has grown from 1 terabyte to 100 terabytes in just 100 days -- adding 1 terabyte a day. No other database installation in the world has grown at this rate. The growth is enabled by the commodity hardware platform underneath -- just add a server or a rack as the data grows. Another early adopter is Aggregate Knowledge, whose dataset has also grown at an impressive rate. There's an interesting backstory to my involvement with Aster. When I taught the Distributed Databases course at Stanford in 2004, my TA was a bright young PhD student named Mayank Bawa. I was very impressed with Mayank's intellectual abilities and his can-do attitude. While working on the course we got to discussing how there is a shift happening in hardware platforms, but no database systems vendor has created a system targeting the new hardware platform. A few months later, Mayank told me he intended to start a company to build just such a database, along with two other Stanford graduate students: Tassos Argyros and George Candea. It was a brain dead simple investment decision for me. Mayank, Tassos and George are among the best thinkers I know on the topic of large scale data analytics. They have been exceedingly thoughtful in the architecture of their new database. They have some really nifty stuff in there, including incremental scalability, intelligent data partitioning, and query optimization algorithms. One of the coolest demos I've seen is when they run a large query that touches terabytes of data, and then kill several of the nodes in the system that are actively processing the query. The system transparently migrates query processing, and out pop the results. This kind of behavior is essential when you're dealing with queries that can take several minutes to hours to execute, increasing the likelihood of failures during query processing, especially when using commodity nodes. The LAMP stack, with MySQL as the base, has transformed and democratized web application development. In a similar vein, I expect that we will see the emergence of a stack that democratizes large-scale data analytics applications. Aster Data could well be the foundation of that stack. Powerset finally launched their search engine last night. It's been over two years in the making, and the company has much hype surrounding their natural language technology. The new search engine has received mixed reviews. For example, while Mike Arrington at TechCrunch fell in love at first sight, the comments following the post tell a very different story. The most balanced review I've seen so far is from Danny Sullivan at Search Engine Land. Disclosure: My company Kosmix also builds search technology, albeit of a very different kind. I don't consider Kosmix in any way to be a PowerSet competitor, and in this post I'm wearing my blogger hat and not my Kosmix hat. Moreover, this post is not really about PowerSet at all, but about data and algorithms, using PowerSet as the example du jour. To boil down both my personal experience playing with PowerSet and what I'm seeing in the reviews: some of the features (like the Factz) are cool. The biggest weakness is that PowerSet today searches only two data sets: Wikipedia and Freebase. And while these are both very large and very useful datasets, they're not nearly enough to answer many real-world user queries. The TechCrunch comments and Danny Sullivan's posts both contain examples that point out the strengths and weaknesses of PowerSet's search. Here's an example from my own personal experience: in my previous post, I used the phrase "new wine in an old bottle". I was curious about the origin of this phrase (since I had also heard people say "old wine in a new bottle" -- which came first?) So I typed the search "origin of expression new wine in old bottle" into both PowerSet and Google. Google nailed it in the first result (from Yahoo Answers), while Powerset was lost. Ditto for "How old was Gandhi when he was killed?" The primary reason Google's search is useful is that there is lots and lots of data on the web, and Google indexes so much of it. Yes, Google's search algorithms are fantastic, but they wouldn't work anywhere as well if they didn't have so much data underneath them. Consider my search about new wine and old bottles. The reason Google nails it is because there's a page on the web that uses the exact phrase I typed into the search box. Same for the Gandhi example. The cool thing for Google is, people who search often use phrases in the same was as people who write web pages (especially on community sites such as Yahoo Answers). Instead of doing any NLP, they just need to index a really huge corpus of text and look for near-exact matches. What of PowerSet? I for one really love their Wikipedia search, and will use them to search Wikipedia and Freebase. As Danny Sullivan points out in his post, perhaps the right business model for PowerSet lies in enterprise search rather than in web search. Yahoo's India team quietly launched Yahoo Glue out of the glare of the media circus around Yahoo these days. Glue has been noticed by a few commentators (e.g., TechCrunch), who mostly see it as response to Google's Universal Search (or Ask's search interface). They might be missing the point. Glue is fundamentally different from Universal Search and represents a whole new way of thinking about search. The fundamental distinction is: where do the results come from? Google's Universal Search searches across Google's properties: web search, image search, YouTube, Scholar, Google News, and so on. Glue, on the other hand, includes not just Yahoo properties (web search, Yahoo! Answers, Flickr), but also pulls in results from WebMD, HowStuffWorks, and even (ironically) Google Blog Search and YouTube. For example, compare Universal Search (diabetes) with Glue (diabetes). In this respect, Glue bears more similarity to mashups such as Addict-o-Matic than to Universal Search. The Web today is a far different place from what it was when Google's search paradigm was invented. The web was then a collection of documents; it is now a collection of applications. Applications such as Facebook, MySpace, YouTube, and Yelp. Each application has its own deep collection of data, and we tend to think of them as being different information types rather than just "web pages". Yet the search model flattens each of these rich interactive services into a collection of web pages that can be indexed -- that's really putting very new wine in a very old bottle. The one-index-fits-all model forces a linear ranking of incomparable types, such as images, videos, how-to content, facts, and opinion. That's really comparing apples to oranges. The correct way is to deal with each of these information sources as a first class citizen, with its own kind of data and interaction paradigm. Let them compete for real estate on a 2-dimensional search results page (as opposed to 1-dimensional list), and may the best ones win. Of course, there are many technical challenges to be solved in getting there. Sending each query to every web application is a recipe for disaster; and dealing with many different APIs is not conducive to scaling. To keep themselves relevant, however, search engines must evolve from indexes to intelligent routers of searches to third-party applications. Dharavi is a slum of over a million souls packed into a single square mile in the heart of Mumbai, India. It holds the dubious distinction of being the largest slum in Asia. Families of 15 crowd into 300-square-feet tenements, sharing the space with many more mice. It's hard to imagine the people of Dharavi as consumers moving up the economic ladder, but that is precisely what is happening. Kashyap Deorah moved back to India from the US recently, and has spent the last several months visiting Dharavi to understand its micro-economy. Every street in Dharavi is home to an electronics dealer. The main business is used cell phones and prepaid SIM cards; India now has over 246 million cell phone subscribers, with the number growing at a scorching pace. One of the hottest items is -- hold your breath -- used flat screen LCD televisions! Surprising, yet clear enough when you think about it: space is at a premium, so slum-dwellers behave rationally in opting for flat screen televisions. This anecdote illustrates the demand for used consumer durables of all kinds among the upwardly-mobile masses in India. McKinsey has published a fantastic study on how the rapidly expanding Indian economy is creating new consumers. This study divides Indian households into 5 segments based on household income: Globals, Strivers, Seekers, Aspirers, and Deprived. The Globals are the super-rich elite; the Strivers and Seekers constitute the middle class; and the Deprived are the destitute outside the pale of consumption. The most interesting class are the Aspirers: these are not quite destitute or middle-class, but are upwardly mobile and aspire to enter the middle class. Today, only 5% of Indian households are in the middle class, 41% are Aspirers, and 54% are Deprived. 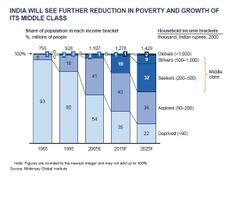 In 2025, the study expects the middle class to have swelled to 41% of households, the Aspirers to remain steady at 36%, while the Deprived drop to 22% of households. What is happening is a massive shift of households from Aspirers to middle class and from Deprived to Aspirers. The people of Dharavi are among today's Aspirers and tomorrow's middle class. Aspirers cannot afford new cell phones, or televisions, or washing machines. But there is huge demand for used cell phones, televisions, and consumer durables of all kinds. In India today, the market for used consumer durables is extremely inefficient, and relies primarily on word-of-mouth. A free flow of information about demand and supply can make the market efficient, and also help millions of people take their first steps to becoming consumers. Given the almost universal penetration of cell phones among Aspirers in India, the natural solution would seem to be a solution that uses mobile phones to help people buy and sell used goods. Kashyap has started a company named Chaupaati Bazaar (named after a famous beachside bazaar in Mumbai) to do just this. The problem is challenging: create a used goods market, make it work entirely through SMS and voice (no web interface), make it work for a semi-literate user base speaking many languages, and figure out the business model. Not a challenge for the faint-hearted, but something that could really make a difference if it can be made to work. I'm proud to join Chaupaati's Board of Directors as its lead investor. Dr. C.K. Prahalad is famous for coining the phrase "fortune at the bottom of the pyramid." The bottom of the pyramid consists of the poorest section of the world's population, who are not viewed as a viable market by most consumer products companies. There are 4 billion people at the bottom of the pyramid, out a world population of 6 billion. This is an opportunity to use technology to eliminate friction at the bottom of the pyramid, enabling at least some of those people to climb the rung to the middle class. I started using Twitter a couple of weeks ago. Many people use Twitter to post status updates, but here's how I've decided to use it: I'll post factoids about data I find interesting: either through personal observation, or because I read or heard it somewhere. For example, I spent the day today at the Digital Hollywood conference in LA, where I got an opportunity to post (from my cell phone) factoids as I heard them from various speakers and panelists. I was also on a panel called "Advertising NEXT" at Digital Hollywood today, on which more in a separate post. My Twitter posts appear on the right hand column of the blog. You can also see them (and, if you like, subscribe to them either via RSS or your mobile) via this link. And let me know what you think. Is Search Advertising a Giffen Good? The Giffen good is a strange beast from economic theory. For most goods, demand decreases as price increases. A Giffen good defies this normal market behavior -- the demand for it increases even as its price increases. Giffen goods have a very interesting history. They were postulated originally by Alfred Marshall in his 1895 book The Principles of Economics. The classic example is staple foods such as rice, wheat, and potatoes. As their price goes up, poor people on a tight budget actually consume more of them, because they are forced to cut back on luxuries such as meat, but still need the same number of calories to survive. Until recently, Giffen goods remained a theoretical beast, with no real documented examples -- until 2007, when two Harvard economists demonstrated that rice and noodles behave as Giffen goods in certain poor parts of China. Google's recent results raise the possibility that search advertising might be a Giffen good. Here's a simple model. Company X spends marketing dollars on two channels: search advertising and brand advertising (on the web or on TV and magazines). Search advertising drives customers directly to their site, resulting in immediate sales. Brand advertising drives organic traffic, albeit in a more unmeasurable way. In an economic downturn, companies get more cautious with their marketing budgets, moving more dollars into measurable and direct channels such as search advertising while cutting back on less-measurable brand advertising. Thus, there is more competition for the clicks, driving up the price (cost-per-click, or CPC) of search ads. Company X, therefore, finds all their increased spend on search marketing actually drives the same or even fewer visitors to their site. At the same time, since they have cut back on brand advertising, organic traffic is decreasing. But wait -- we need to make this quarter's numbers! The easiest way to do that is cut back even more on brand advertising and channel even more dollars into search, which can drive immediate clicks towards the end of the quarter. Brand marketing's ROI is longer-term, while this quarter's revenue is a more pressing concern. Witness the result: company X spends more on search marketing, driving more search ad clicks to its site, at a higher price point. The definition of a Giffen good! Interestingly, unlike the rice-and-noodles example, the increased consumption directly leads to the increased price, because of the auction pricing model. Google's recent results seem to confirm this hypothesis: paid clicks increased by 20% from Q1 2007, while ad revenues increased by 40%, implying a CPC increase of 16%. Of course, there's a limit to this phenomenon: companies cannot pay for more their ad clicks than their profit margins allow. Until that time, the sucking sound you hear is everyone's profit margins going into Google. We're going to see a lot of low-margin revenue increases at online retailers and other companies that rely on paid search. A high-ranking Amazon executive told me there are 60,000 different customers across the various Amazon Web Services, and most of them are not the startups that are normally associated with on-demand computing. Rather the biggest customers in both number and amount of computing resources consumed are divisions of banks, pharmaceuticals companies and other large corporations who try AWS once for a temporary project, and then get hooked. This is epochal stuff -- banks and pharma are notorious late adopters of early-stage technology, so to see them in the vanguard of cloud computing (or perhaps I should say utility computing, but everyone says cloud) is astonishing. But it illustrates a very important detail that's been overlooked: that there are significant network effects to the cloud computing business. Code that works with large amounts of data needs to be close to the data (in the network topology sense). Any processing that consumes data generates data. So, once one enterprising group within a company decides to place some data in S3 and the code to process it on EC2, it becomes a whole lot easier for someone else within the company who needs to run some other code on the data, to move the processing to EC2. And since all this processing generates even more data, we have a virtuous cycle building up. The stable state is for all of a company's data processing tasks to move into the same utility computing cloud, to take advantage of the co-location and minimize data transfer latency and costs. The network effect extends across companies as well. Often data created by company A is consumed by company B. When this "data interface" is voluminous, it makes economic sense for company B to move into the same utility cloud as company A. There are some ecosystems where utility computing players are already exploiting this trend; for example, AppNexus is creating a utility cloud optimized for the use of ad networks and their associated ecosystem: analytics for publishers and advertisers. There is so much data being shared here (on ad campaigns and their performance) that there is significant advantage to being in the same cloud. The network effects argument leads to the interesting possibility that cloud computing becomes a winner-take-all game, like auctions; we might end up with one winner (maybe Amazon?) A more likely outcome is, we might end up with a couple of big general-purpose clouds (Amazon and Google, perhaps?) and a few niche clouds optimized for different ecosystems (such as ad networks and social networks). Readers of this blog will be familiar with my belief that more data usually beats better algorithms. Here's another proof point. Google announced earnings today, and it was a shocker -- for most of Wall Street, which was in a tizzy based on ComScore's report that paid clicks grew by a mere 1.8% year-over-year. In the event, paid clicks grew by a healthy 20% from last year and revenue grew by 30%. In comparison, SEM optimizer Efficient Frontier released their Search Performance Report on their blog a few hours ahead of Google's earnings call. EF manages the SEM campaigns of some of the largest direct marketers, handling more SEM spend than anyone in the world outside of the search engines themselves. Their huge volumes of data give them more insight into Google's marketplace than anyone outside of Google. EF reported a 19.2% increase in paid clicks and 11.2% increase in CPCs at Google Y-O-Y. Do the math (1.192*1.112 = 1.325), that's a 32.5% Y-O-Y revenue increase. That's the closest anyone got to the real numbers! And this quarter is not a flash in the pan: in January, EF reported a 29% Y-O-Y increase in SEM spend, with 97% of the increased spend going to Google: that is, about a 28% Y-O-Y revenue increase for Google. That compares very favorably with the actual reported increase of 30%. As Paul Kedrosky points out, this is a huge indictment of ComScore's methodology (ComScore's shares are trading down 8% after-hours post the Google earnings call). ComScore sets a lot of store on their "panel-based" approach, which collects data from a panel of users, similar to Nielsen's method of collecting data on TV viewing using data from a few households that have their set-top boxes installed. ComScore has been in this business longer than anyone else, and has arguably the best methodology (i.e., algorithm) in town to analyze the data. They're just not looking at the right data, or enough of it. Some simple math using the mountain of data from EF handily beats the analysis methodology developed over several years using data from a not-so-large panel. To my mind, this also puts in doubt the validity of ComScore's traffic measurement numbers. For websites where I personally know the numbers (based on server logs), both Quantcast and Hitwise come far closer to reality than ComScore. The latter two don't rely as heavily on a small panel. ComScore's value today is largely driven by the fact that advertisers and ad agencies trust their numbers more than the upstarts. Advertiser inertia will carry them for a while; but a few more high-profile misses could change that quickly. Disclosure: Cambrian Ventures is an investor in EF. However, I don't have access to any information beyond that published in their public report. Can SMS be a publishing medium? When we think of SMS (Short Message Service), we think of short text messages sent between friends, or to small groups via services like Twitter. This is how the Internet started too -- primarily as a communication medium. But soon the World-Wide Web made the internet a publishing medium as well. The question is, can SMS messages to mobile phones become a free, ad-supported publishing medium? It seems unlikely, given the limitations: text messages must be no longer than 160 characters. In addition, they also cost both the sender and the receiver. Huge cell phone penetration -- 246 million and counting. Very low internet penetration -- about 20 million internet connections. A cost structure where senders pay for text messages but recipients don't. I met today with Rajesh Jain, whose company Netcore offers a service called MyToday in India that is is effect the first SMS publisher. Rajesh Jain is an Internet pioneer, having started India's first internet portal, indiaworld.in, back in 1994 -- he sold it for over $115 million in 1999, in what was perhaps the first big Internet deal in India. You can do a lot within 160 characters, if you try really hard and your expectations are not very high. I remember fitting very playable video games into 16K of RAM on my Sinclair Spectrum when 48K was way too expensive. I looked at some of the MyToday examples, and I'm impressed. It's possible to split stories across multiple text messages; more and more phones have the ability to handle messages larger than 160 characters; the SMS transport breaks them up into 160-character chunks and the phone re-assembles the message. The real economic key to this whole enterprise, though, is the cost structure of SMS in India. There you don't pay to receive a message, only to send it. So for subscribers the service is entirely free, after the initial message to subscribe. And the numbers prove it. MyToday has over 3 million unique subscribers, each with 3 subscriptions on average. They send more than 10 million text messages a day, making them India's largest sender of text messages. For MyToday, ad rates today are still below the cost of sending a text message, but text messaging rates -- especially for huge bulk purchases -- are falling dramatically, so it's not hard to see the crossover happening next year. And that could usher in the era of the SMS publishers.